Culture Night 2016 will soon be upon us, and UsFolk will be hosting an Illustration Family Feast event on the day (1-9pm) at Ulster University. 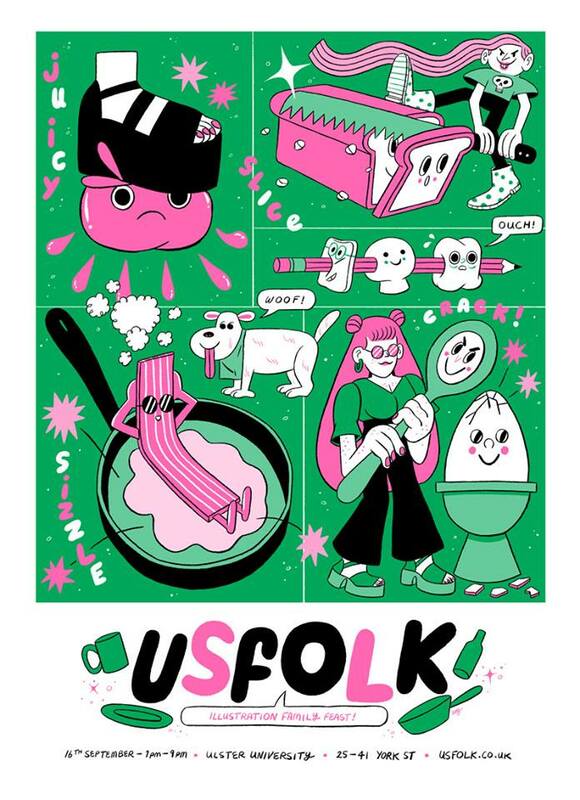 We will be running a number of events such as a pop-up exhibition and shop selling UsFolk illustrators limited edition 2-colour Riso prints from Hato Press in London. Belfast Print Workshop have also teamed up with us to do some live screen printing of the Stephen Maurice Graham artwork (below). There will be a number of drawing workshops throughout the day including a live draw, an Illustration Booth and the Family Feast illustration banquet table; available to all ages and drawing skills to take part in. We will also be having a preview of the Riso prints on the Thursday 15th September at our studio gallery from 7pm onwards. Refreshments will be provided.